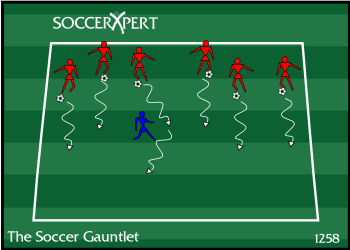 The primary focus of THE SOCCER GAUNTLET is centered around proper dribbling technique in traffic which requires vision and awareness. Create a grid approximately 20x15 yard. Instruct one defender to stand inside the grid without a ball. The remaining players will start on the end line with a ball. On the coaches command, all of the attacking players dribble at speed to the other sideline avoiding the defender. If the defender wins the ball and kicks the ball out of the grid, that attacker becomes an additional defender (without a ball) on the next series. The last player to make it through the gauntlet wins the game. Limit the foot the attacker can dribble with (the right foot, the left foot, and the bottom of the foot).